This Dzi stone is extraordinary and rare. It was found in Lhasa, Tibet in 1996. I have only seen one in my life, and I have only seen one photo of it's like in a book. I call it a "Heaven and Earth" Dzi. The circle is heaven and the square is earth, much like the Chinese coin. Dzi (pronounced Zee) is a Tibetan word used to describe a patterned, usually agate, of mainly oblong, round, cylindrical or tabular shape pierced lengthwise called Heaven's Bead (tian zhu) in Chinese. "Pure" dZi beads, in the traditional Tibetan system for evaluating dZi, are regarded as the most valuable and desirable variety. 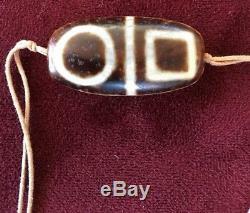 Dzi Bead is an eons-old antique, ALSO it remains fashionable. It is unclear to many bead scholars the exact origin of dzi bead, why, when and how it was manufactured. The meaning of the Tibetan word "Dzi" translates to "shine, brightness, clearness, splendour". The beads originate in the Tibetan cultural sphere and can command high prices and are difficult to come by. They are found primarily in Tibet, but also in neighbouring Bhutan, Ladakh and Sikkim. Shepherds and farmers pick them up in the grasslands or while cultivating fields. Because dZi are found in the earth, Tibetans cannot conceive of them as man-made. Since knowledge of the bead is derived from oral traditions, few beads have provoked more controversy concerning their source, method of manufacture and even precise definition. This all contributes to making them the most sought after and collectable beads on earth. Legend of the Dzi beads. 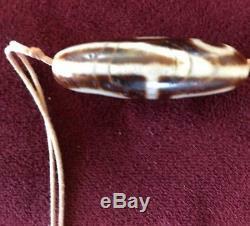 The Dzi bead itself has mythological and legendary elements. During those early years when Tibet was overwhelmed by severe epidemic, Tibetans were plunged into an abyss of misery and they led a very hard life. Fortunately, the compassionate Vajravarahi Buddha came to relieve them by dropping magic Dzi beads from the sky. Anyone who were predestined to obtain them would be relieved from disease, calamities and bad luck. Ingredients of the Pure Dzi beads. Made of super-grade natural agate chalcedony, the pure Dzi bead possesses a distinctive magnetic field with powerful energy. In terms of its appearance, it is classified into black brown ones and light brown ones. Its totem is an creamy-white line, which deeps into the central point. Some scholars point out that one of the characteristic features of Pure Dzi is that it is creamy white within the perforation. Creamy white is considered the most desirable. AAll dimensions provided are estimated values. Please bear in mind that the photo(s) may vary slightly from the actual item due to the lighting during photo shooting or the monitor's display. We may not have a complete description of the item. We put in a lot of time and effort in packing our items. Your kind understanding of our situation is greatly appreciated. 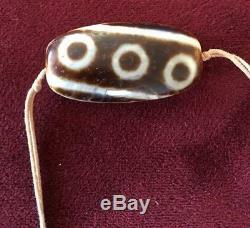 The item "Rare Extraordinary Tibetan Dzi stone from Lhasa, Genuine Antique Gzi Bead Amulet" is in sale since Monday, August 13, 2018. 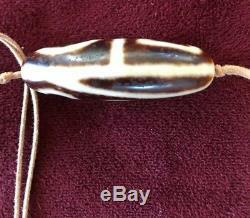 This item is in the category "Collectibles\Beads\1950-Now". The seller is "anthonyd_1" and is located in Carmel, California. This item can be shipped worldwide.